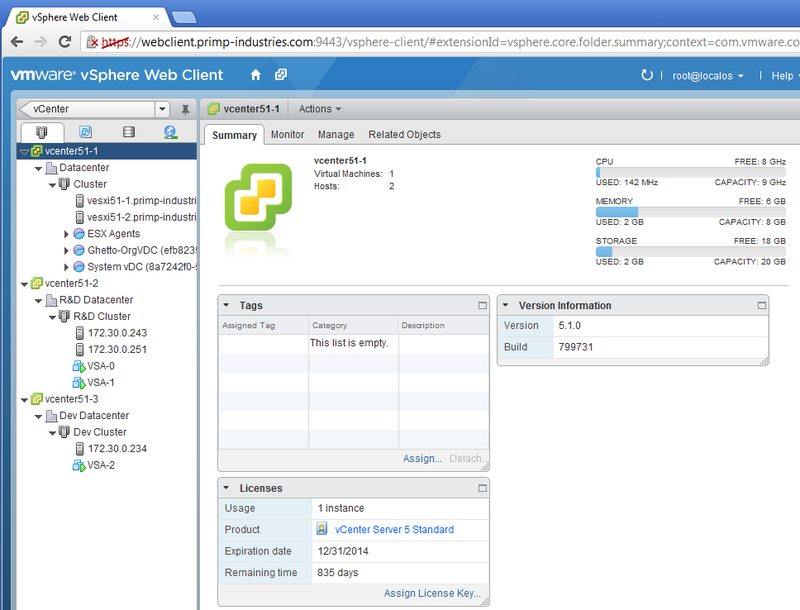 Did you know in vSphere 5.1, you can now configure multiple vSphere Web Client servers to multiple vCenter 5.1 Servers and get a single view of your entire infrastructure as well as provide redundancy to the vSphere Web Client? 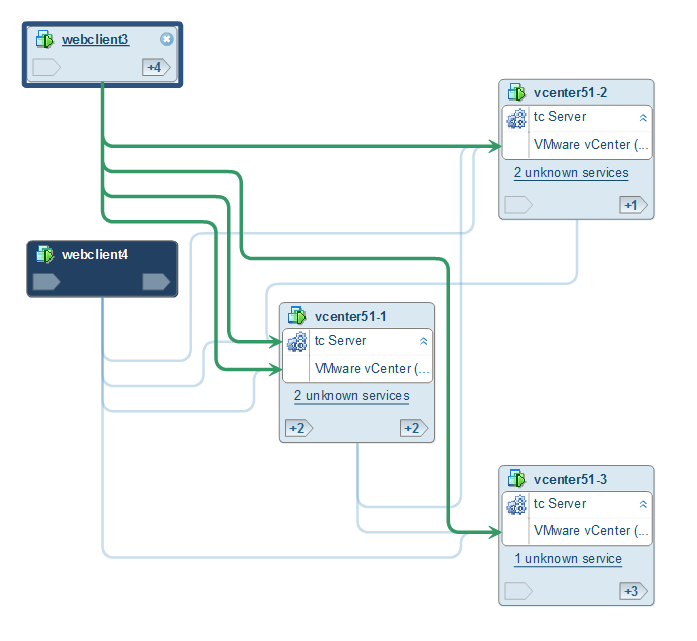 This is all made possible with the new vCenter SSO (Single Sign-On) and Lookup Service feature. When you first install vCenter Server, you can install the vSphere Web Client on the same machine or you can install it on a separate machine. If you decide to install the vSphere Web Client on a separate system or add additional vSphere Web Client servers, you simply just need to point them to your main vCenter SSO instance. Note: If you wish to re-point or re-register other vCenter Server components, there is nice VMware KB that goes over all the steps. Before getting started, it is very important to ensure you have proper DNS resolution (forward / reverse working) on all your Windows servers. If you are running Windows, when you install the vSphere Web Client, you will be brought to a screen to specify your SSO Administrator credentials ([email protected] for windows) or (root for VCSA) as well as the Lookup Service URL which will be the same system running your vCenter SSO service. Note: In my lab, I am using the VCSA for my vCenter Server as well as my SSO server, but this can also be a Windows vCenter Server and SSO Server. You also have the ability to re-point your vSphere Web Client to another vCenter SSO server and you can do so by using the following script: C:\Program Files\VMware\Infrastructure\vSphereWebClient\scripts\client-repoint.bat To use the script, you just need to specify the new Lookup Service URL along with the SSO Administrator credentials. 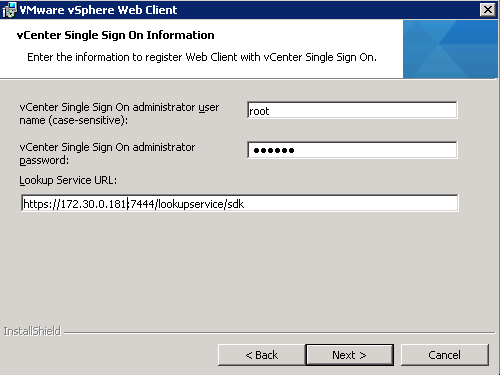 Once the script has finished registering with the new vCenter SSO server, you can now connect to the vSphere Web Client URL by going to https://[webclient-hostname-ip]:9443/vsphere-client and you now should be able to see all the vCenter Servers that have registered with the same vCenter SSO server. Here is another view using the new VIN 1.2 (vSphere Infrastructure Navigator) to show that I have two vSphere Web Client servers (webclient 3 and webclient4) registered to my primary vCenter SSO Server (vcenter51-1) as well as two additional vCenter Server (vcenter51-2 and vcenter51-3) that are also registered with the same SSO Server. FYI - If you are interested in using the VCSA and only enabling the vSphere Web Client feature, the process is slightly different and I will share the procedure in a separate post.